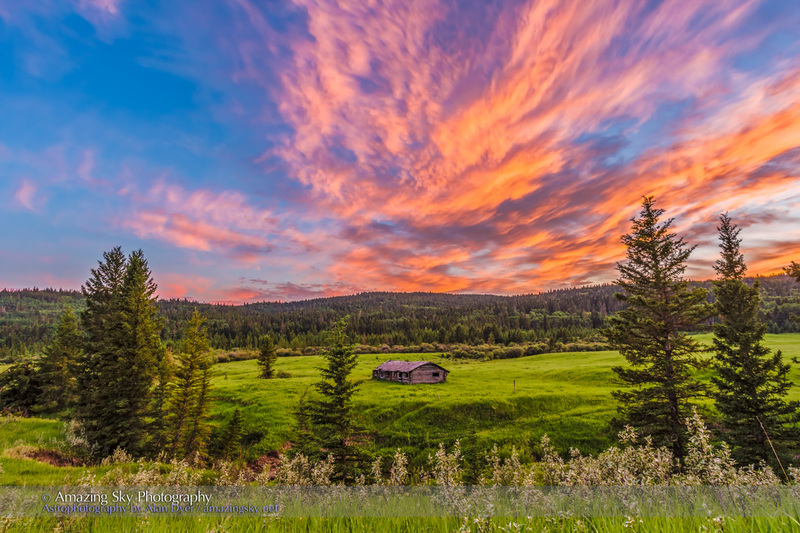 The clouds paint the sky at sunset over a pioneer cabin in the Cypress Hills. This is a scene the original resident of this cabin would have enjoyed – and painted. This lonely log cabin in the Battle Creek valley was built by Robert David Symons, renowned as a rancher, naturalist, game warden, and painter, in the style of western artists such as Charlie Russell. The cabin looks like it dates from the pioneer days of the first European settlement of the area, in the late 19th century. But Symons settled here and built this log cabin in 1939, during the time he worked as a game warden in the Hills, posted at the Battle Creek Ranger Station. He lived in the cabin for only three years before selling it to Albert and Sylvia Noble in 1942. The Nobles expanded the cabin to accommodate their family. They lived here for 10 years, working a sawmill in the area. Today the cabin is a scenic stop on the rough and often muddy Battle Creek Road that winds from the Alberta to the Saskatchewan side of Cypress Hills Interprovincial Park. Travelling it is like being back in the 1940s, when roads were no better than improved cart tracks. 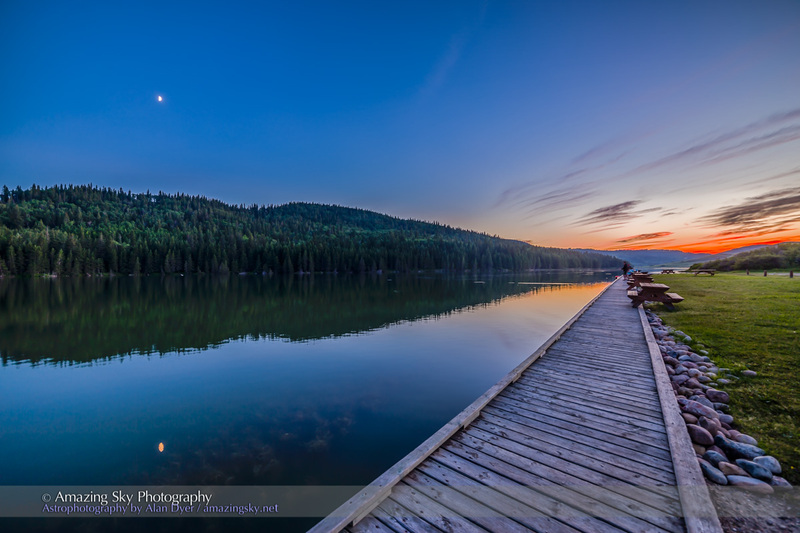 I spent an evening here two nights ago on a perfect summer night, shooting the sunset and then the cabin scene by moonlight using time-lapse cameras and gear. 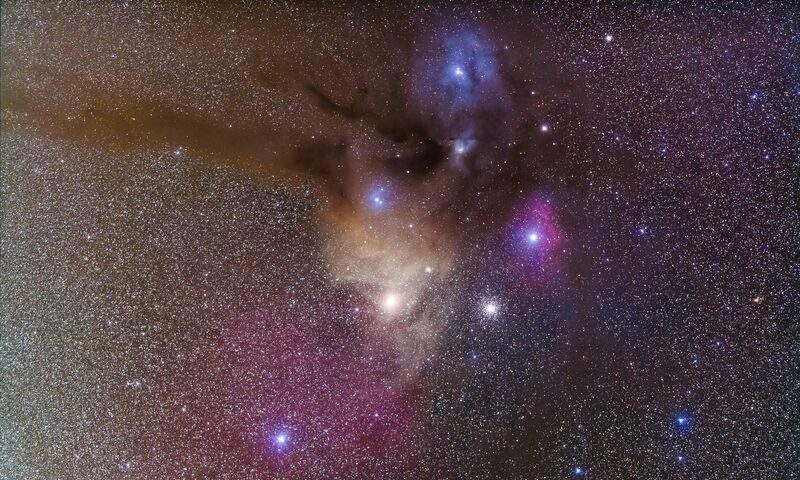 The main scene at top is a high dynamic range stack of 6 images to preserve details in the bright sky and dark foreground. The self-portrait is a single shot taken by moonlight. Mars and Spica are just setting as a pair of stars over the hills across the valley. It was a magical night in the Hills. 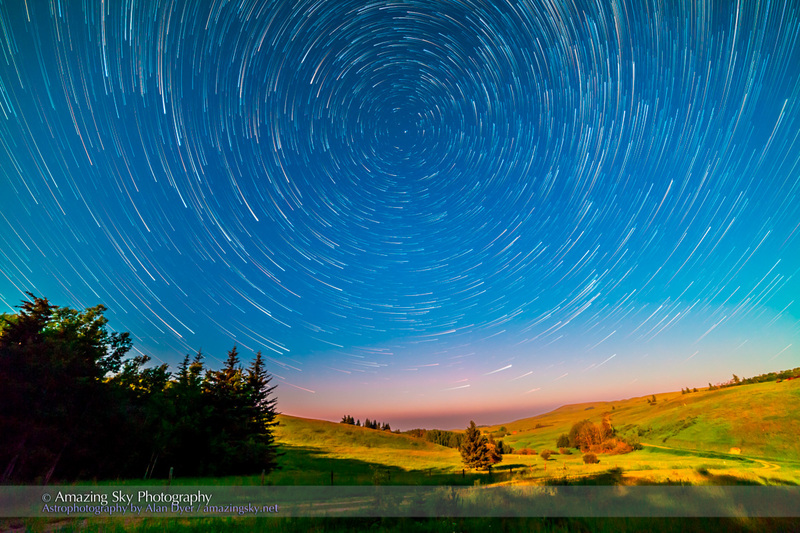 The stars swirl in circles above the big sky country of the Canadian Prairies. For these images I set the camera to take hundreds of images over the course of about 4 hours, then stacked about 100 frames for each of the composites. I stacked the images with the application StarStax. 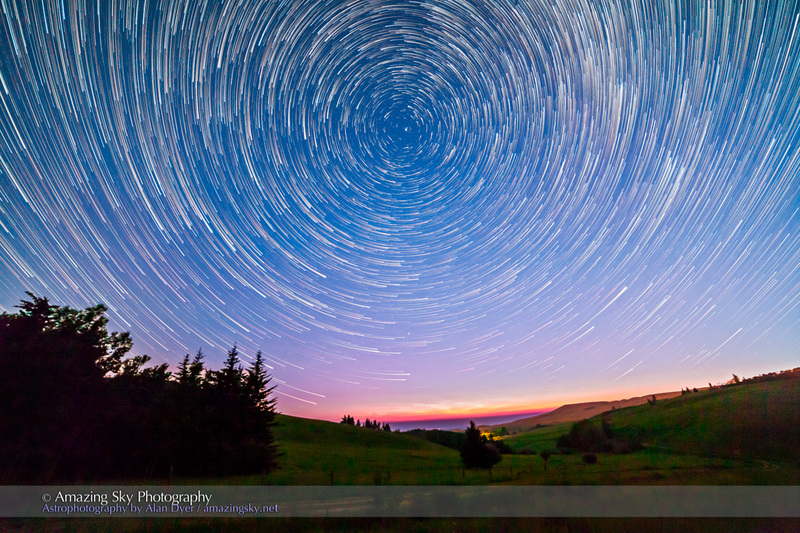 The result shows the stars circling the North Celestial Pole and Polaris in the northern sky. The top image is from earlier in the night when the Moon was still up lighting the landscape. The image above is from late in the night, after moonset, and with the glow of dawn beginning to brighten the northern sky. Some low noctilucent clouds are also appearing on the horizon. 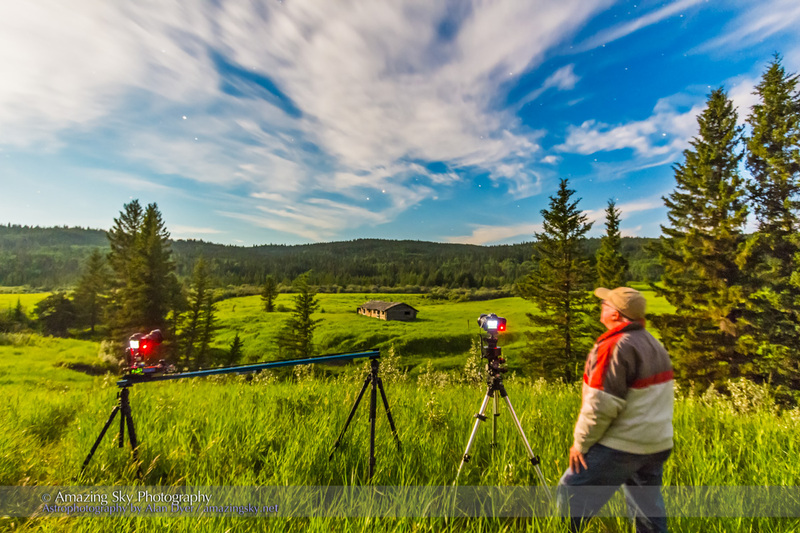 This was a beautiful night at Reesor Ranch in Saskatchewan, on the edge of Cypress Hills Interprovincial Park, on the Alberta-Saskatchewan border. I’ve just wrapping up a week of shooting here with clear nights every night but two. The hard drives are full! The sky lights up pink to match the wild roses in Cypress Hills. 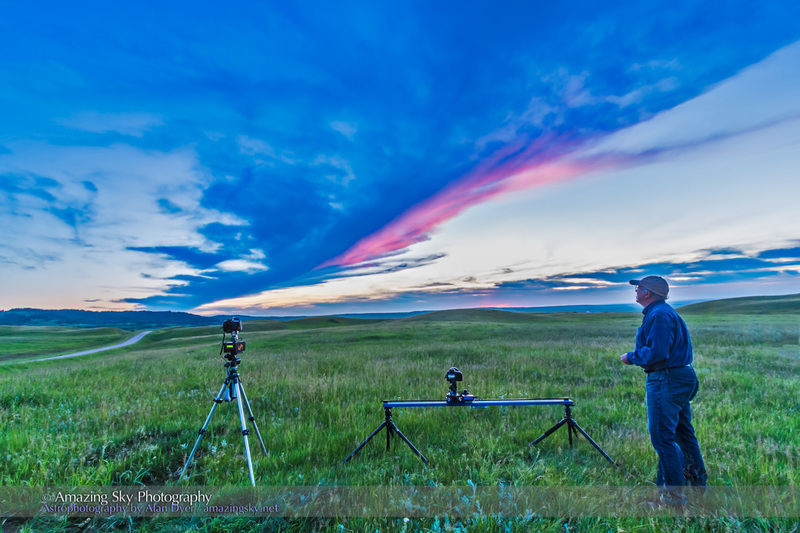 Last night the twilight sky over the Cypress Hills was simply stunning. The clouds contrasted with the blues and pinks of twilight. On the way out to an evening shoot I stopped to take this image of the darkening sky colours behind the blooming wild roses, the floral emblem of Alberta. In this photograph I’m looking east, opposite the sunset. The dark blue on the horizon is the shadow of the Earth rising. Above the shadow is a fringe of pink, the Belt of Venus, from red sunlight still lighting the upper atmosphere in that direction. Its colour nicely matches the pink roses – Earth and sky in colour coordination. This is a high dynamic range stack of 6 exposures, to capture the bright sky and darker foreground in one image, to render the scene as the eye saw it but the camera could not, at least not with a single exposure. 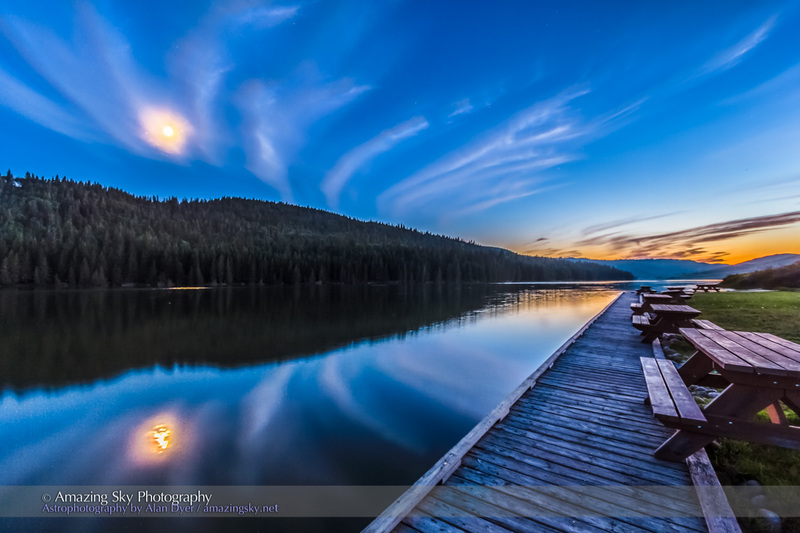 The Moon shines over the still waters of a prairie lake. On Saturday, July 5, the Moon put on a super show in the twilight sky. The Moon was exactly at first quarter phase 90° from the Sun, and it shone between Mars and the star Spica, for a tidy 3-world conjunction in the evening sky. 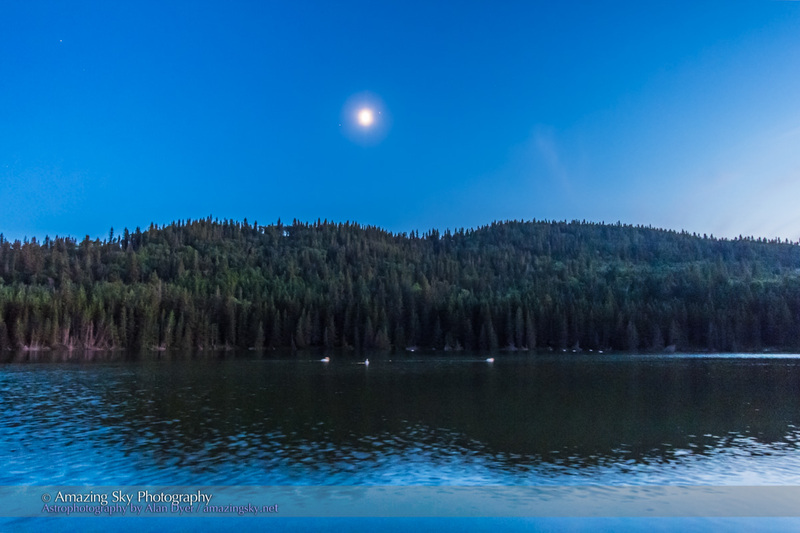 For these shots I was at one of my favourite places for nightscape shooting, Reesor Lake in Cypress Hills Interprovincial Park. These are still shots taken with one camera while two others were shooting time lapses of the fall of night and the Moon moving over the lake. Later in the evening, some photogenic cirrus clouds moved through the scene, nicely filling out the composition. Here, you can see Mars to the right of the Moon and Spica to the left of the Moon. Below, on the water swim three white American pelicans that frequent the prairie lakes around here. This was a perfect night. The anglers weren’t catching too much despite the fish leaping from the water every few seconds. But I managed to catch some nice photos and movies. It was a fine summer night to enjoy the sky. The setting Sun provided a fine light show on the open range of the Canadian Prairies. 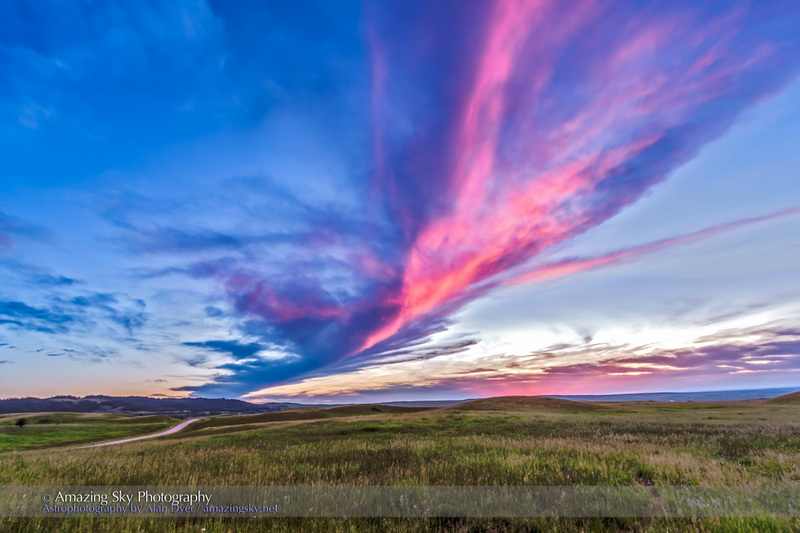 This was the scene Friday evening, July 4, as the Sun lit up the clouds in the big sky of the Historic Reesor Ranch. I’m here for a week of intensive shooting and writing. On the first night the setting Sun put on a fine show, captured in still images, like the high dynamic range composite above, and in time-lapses captured with the motion control gear below. When I took these shots I was likely right on the 105th meridian, the line of longitude that marks the boundary of Alberta and Saskatchewan. Either way, the land is expansive and stunning. 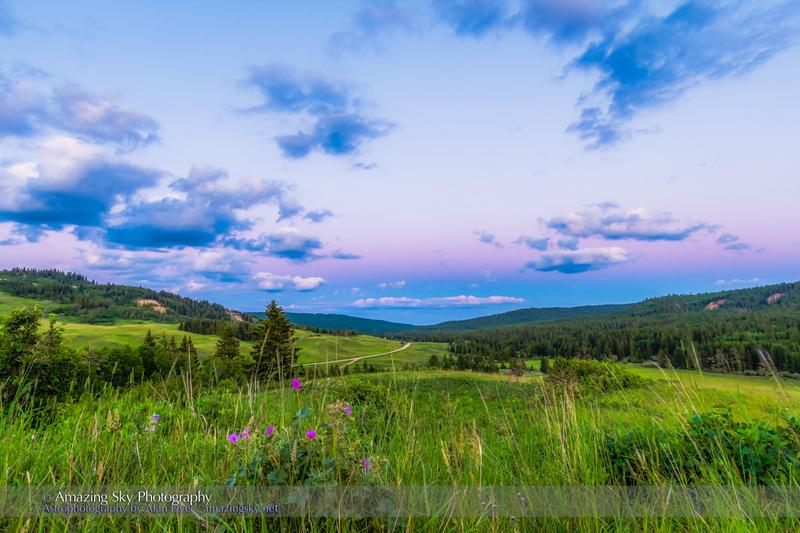 Just to the south the land rises to the Cypress Hills and the namesake provincial park where I’m spending most nights shooting stills and time-lapses. More to come this week I’m sure! 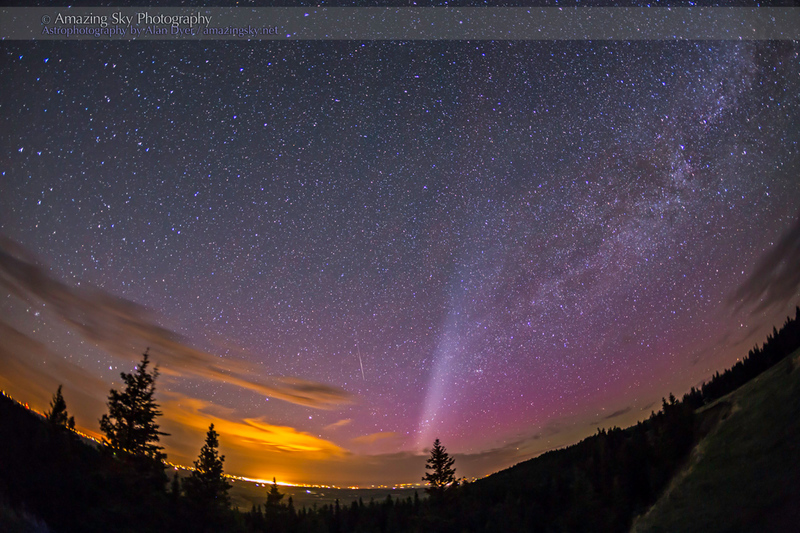 The Milky Way, an odd aurora, and the glow of urban light pollution lit the sky. But alas, no meteors! On Friday afternoon, May 23 I headed 3 hours east of home toward the clearest skies in the province. The quest was for sightings of the Camelopardalid meteors, the new and much publicized meteor shower from Comet LINEAR, 209/P that had been predicted for tonight. I had very good skies for the first couple of hours of darkness, from a viewpoint looking north over the prairies on the high rim of the Cypress Hills, Alberta. Clouds did move in about 12:30 a.m., about the time the shower was to be peaking. But up to that point I had sighted just a handful of meteors and many were likely random ones, as they didn’t seem to be streaking out of the radiant point. A few other people who had converged at the site saw other meteors to the south that might have been shower members. Perhaps the peak came later under cover of clouds. But up to 12:30 a.m. I saw little sign of an active shower. Still, it was worth taking the chance to chase into clear skies in hopes of bagging a herd of Camelopardalids. I shot hundreds of frames with two cameras and none picked up a Cam meteor – lots of satellites, like the streak at lower centre. And for a few minutes this strange white auroral curtain appeared, slowly drifting from east to west across the northern sky, like a searchlight, above the magenta horizon glow of low-level aurora. To the northwest glowed the lights of Medicine Hat, illuminating the clouds toxic yellow in a classic demonstration of light pollution.